Let's get all the positive garbage out of the way right now. Andy Murray did play well during the Olympic games. He was clearly a man on a mission. He eschewed his usual routine of clutching body parts during tough moments. 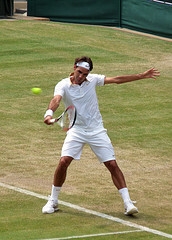 His attitude was good, he played high energy, fast tempo, good quality tennis. Well done. When he was seventeen I predicted he would never win a grand slam trophy. I'm quick to admit he's now making me worry about that bold statement. Over the past four months, he's improved his fitness, attitude and approach. He has tightened up some weaknesses in his game. He appears to have momentum and genuine focus. Lendl has played a role in making me willing to admit that I may be wrong about Andy Murray. Should that be the case, I'll tip my hat to him when the moment arrives. Let me make one thing clear; I'm not altering my original prediction. John Hovis is sick of the pandering to Andy Murray in the UK press. Although John Hovis has now, in public, congratulated Andy Murray (in the form of coloured dots on a screen that no-one will read), John Hovis would like to remind the myriad dafties who watch tennis for a two weeks per year and have suddenly decided that Andy Murray winning a gold medal equates to him winning Wimbledon...no he hasn't. 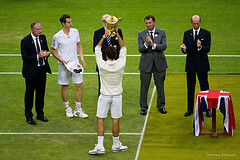 Andy Murray has won the fifteenth most important tournament of the year (in terms of ranking points). Tennis shouldn't even be in the Olympics. If a gold medal isn't the top achievement in your sport, your sport shouldn't be there. 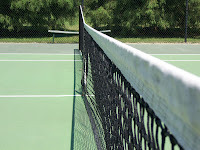 The only tournaments which really matter to tennis players, fans, coaches and officials are the four slams. Someone could make an argument about adding Davis Cup. It won't be me. Photo by Squeaky Knees via Flickr with thanks. Returning to the main point; well done Angie. You know it's not a slam. It may help propel you to one (and the US is surely your best chance) but a note to you and your new fans. In terms of tennis, the Olympics is far down the pecking order. The slam counter is still at zero. That's a fact. On this blog we deal with FACTS. And idle speculation.